What are the Main Differences between Garden Windows & Bay Windows? Are you in need of a new window but are unsure of what type is best for you and your home? Making the decision can be difficult, that’s why it’s important to understand the benefits that each type of window offers. Are you looking for an elegant focal point or a mini greenhouse? There are endless ways that you can customize your bay or garden window to fit your specific needs. Just imagine waking up in the morning and drinking a cup of coffee while gazing out your new bay window, enjoying a gentle breeze. Or looking out your garden window while you water your favorite plants. In this post, we will discuss the differences between garden and bay windows, and the benefits of each. Bay windows are composed of a center fixed window and have venting windows on either side that can be double-hung windows or casement windows. Due to their size and shape, bay windows can create window seats, which can be a wonderful place for reading and relaxation, or can be used for displaying décor. 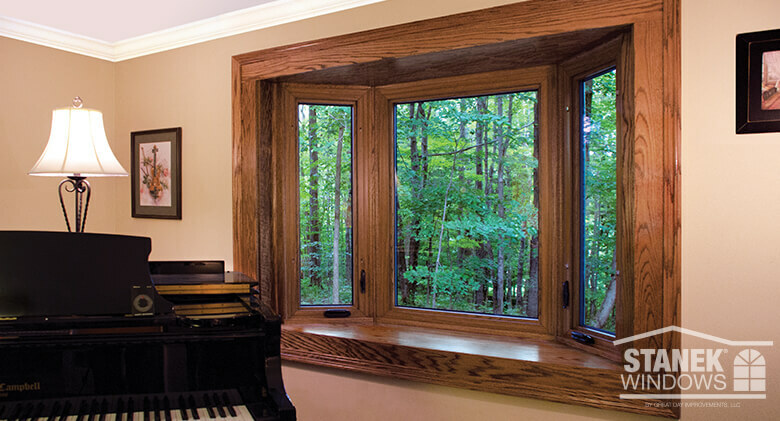 Garden windows typically use casement windows as end vents for an unobstructed view, adding more light to your space and making it feel larger. Do you have an area of dead space in your room that you don’t know what to do with? Adding a bay window can give function to an area that was not usable before. Adding a garden window can create a safe place for your plants to live without being in the way or getting knocked over. Need help visualizing the difference? 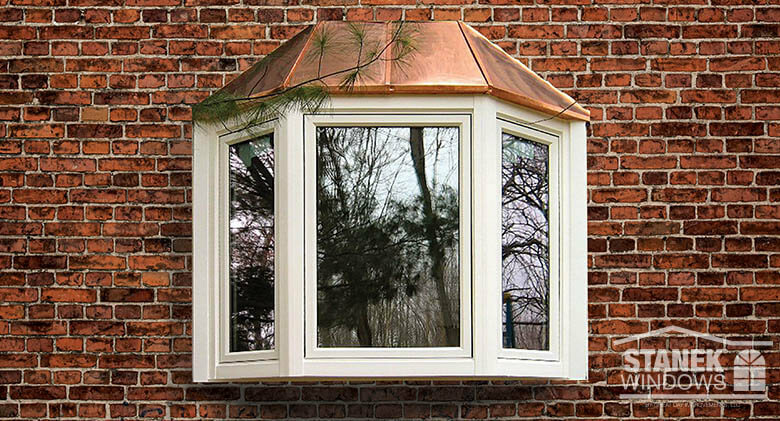 One of the distinguishing factors that differentiates a bay window from a garden window is its angle. Bay windows are angled away from the wall at a 25- to 45-degree angle, while garden windows are angled at a 90-degree angle to create a box-like window. A second factor is the size that each window style can be manufactured in. Garden windows are generally available in standard sizes up to 72” x 48”, while bay windows can be custom made in much larger sizes to fit virtually any window opening. Bay and garden windows also differ in the way they are used. Bay windows are typically used to create a focal point in a living room or a dining room, while a garden window has an interior shelf that you can use to grow plants or display items, and is generally installed in kitchens. Garden windows also have an additional pane of glass that acts as the “window roof.” Another benefit of bay windows is that they can sometimes be used as window seats, providing the perfect spot for reading or relaxing. Due to their larger, three-window design, bay windows also allow an abundance of natural light to enter your room. Whether you choose a garden window or a bay window, either will add character to your home. If you want to add more light to a dining area, a bay window can create a cozy feel with added natural light. The additional light can also open up a room, making it appear larger than it may actually be. It’s amazing what a little light can do to a room! A bay window doesn’t just add character to the interior of your home, but can also add curb appeal to the exterior. A beautiful window that projects outward gives your home architectural character. Are you looking to bring nature indoors? Then a garden window may be the perfect solution. Garden windows create an excellent display place for your houseplants or herbs, while allowing them to take in direct, natural light. Because of their design, garden windows and bay windows can both increase ventilation in your room. Their three-window configurations with end vents allow a gentle breeze to enter your room from different angles. 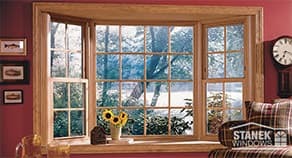 Adding a Stanek bay window to your home will create a focal point in your favorite room that you can enjoy year-round. At Stanek Windows, the versatility of our window frames allows you to choose a style for each window opening and create the perfect look for your space. Our endless custom options give you the opportunity to match your new windows to the architectural style of your home. 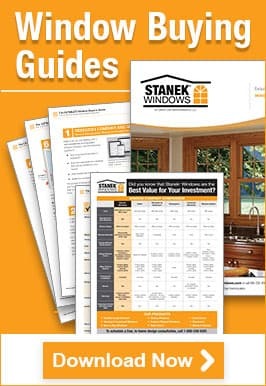 Not only are Stanek windows beautiful, but they also provide energy efficiency. According to the federal government’s Department of House and Urban Development studies, up to 70 percent of energy loss occurs in windows and doors, with 90 percent of window heat loss occurring through the glass. Our Comfort-Gard® PLUS glass features a multi-layer soft-coat low-E coating and is insulated with argon or krypton gas to keep warm air in your home during the winter and cold air in during the summer. Our window glass also blocks 90 percent more UV rays than average glass, which keeps the warm air out of your home in the summer months and can help decrease fabric fade on window coverings, rugs and upholstery. 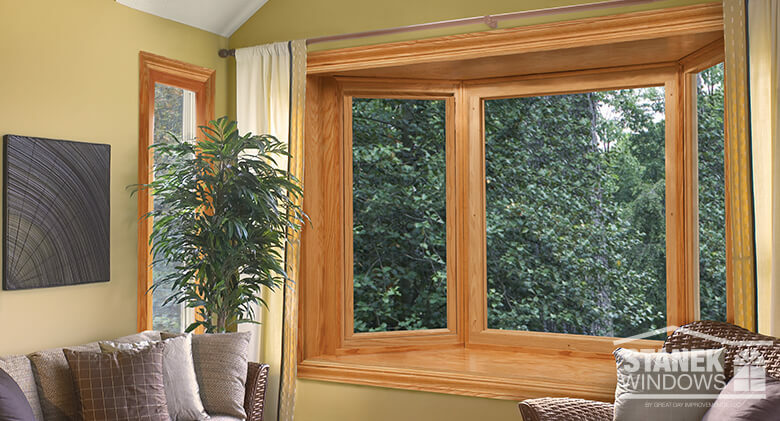 Beyond saving energy costs, a Stanek bay window will also add overall curb appeal and value to your home. Bay windows add extra dimension to the interior and exterior of your home. Our sleek and durable hardware finishes give you the ability to match your window hardware with the rest of the hardware in your home. Along with their beautiful look, our windows provide added security to ensure safety for you and your family. If you’re ready to start designing the perfect Stanek bay window for your home, schedule your free, in-home estimate or give us a call today!